If I were a bee, this book would be my alluring pot of honey. Of course, I’m not a bee. However, I love to slurp down honey anytime, so I still made a beeline for it. Enough of the puns. In all seriousness, this book is packaged with all the questions I have been torturing myself with (and unfortunately, a few around me) for the last two years. Fortunately, I have been building myself to the “answers” or explanations provided in this book, so, although most of the material was not a drastic eye-opener per se, the discussions nonetheless are quite interesting (if cynical), thought-provoking and analytical. Besides, they form solid pillars in a not-so-robust shack of theories in my head. The need for altruism, compassion and friendship has no real noble nature. They have been plugged into us, for without such a design we can’t hope for harmonious existence. And without the promise of some semblance of harmony, Nature dreads that we will bring about an apocalypse and destroy every shred of our gene prints. Wright defines Nature's plan as reciprocal altruism. Fundamentally, altruism exists and is glorified since we expect (at some sub-conscious, unconscious level), reciprocation of all the good deeds. In Hindu philosophy, this is termed as Karma. We are constantly reminded that good begets good, and bad begets bad, and are urged to do good. This is precisely what Nature believes in, but, in a more pragmatic manner. Our social structure couldn’t have grown to this state without this design. Without such a refined, moral social structure, our species couldn’t have progressed to this extent. Every single “good” intention and feeling programmed into us is for our own self-interest. Our ingrained sense of justice and retribution is to ensure that every set of genes has an “equal” or fair chance of survival. When we are twinged with hurt, its Nature’s way of reminding us that we need to step up, assert ourselves and work aggressively towards our interests. As a matter of fact, natural selection rarely urges us to forgive or forget. It mercilessly pushes us into the fray of intense competition for the proliferation of our genes. One might wonder how philanthropy or working towards a successful and noble career would be marked with undertones of gene proliferation. But in a round-about way, it does, or at least that is Nature’s intention. Philanthropy helps revive gene-pools which are threatened to dwindle, and the moral reputation built from such deeds help us lead a better life (the boomerang of reciprocal altruism). Every noble ambition is tainted with self-serving needs, although not blatantly apparent. In our current social structure, some instincts may not be as pertinent, yet, they exist, while successfully tricking us into thinking that our ambitions stem out of higher, and nobler, rational thought. This is beautifully compared with the Freudian theory of unconscious repression, and the role of the Id and Super-Ego in bolstering the Ego. The conscience, feelings of nobility and altruism would be our Super-ego, Id would be the wrapped up version of natural selection’s instincts, both of which work in uncanny ways to serve the Ego. 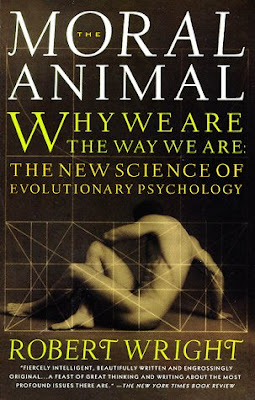 The whole book is organized around Darwin’s own life, his decisions and thoughts. Darwin is celebrated as a man with high Victorian virtues, with a delicate conscience and sympathetic bent of mind. He is known for caring for every living creature around him, for his compassion, altruism and staunch principles. But Wright does a wonderful job of drawing parallels from this great man’s life to elucidate the underlying design of natural selection. The discussions on the implications on morality are thoroughly researched and presented. Although it’s a little unsettling to ponder on the vacuousness of concepts such as “good”, “bad”, and morality, as standalone “truths”, it opens a new horizon of thinking, which is much more practical and utilitarian. The utilitarian maxim is to work towards maximizing “happiness” (overall “good”), in any situation that has a tussle between “right” and “wrong”. Wright expatiates upon Utilitarianism as being the most pertinent theory of morality to mesh with human nature, as well as with natural selection’s drive. Happiness is a frowned upon concept with austere religious doctrines. Although most religions seem to abhor the pursuit of happiness, they are in fact only propelling the notion of non-sensual bliss, not all sorts of happiness. Spirituality does prescribe the route to lasting happiness, devoid of sensory pleasures. This wisdom is in fact precisely the way out of natural selections clutches - of its continuous egging towards attaining one form of sensory pleasure or the other, only to leave us unsatisfied and in search for more pleasure. With more search for pleasure, there is an increased chance of proliferating our genes. The book contains a wealth of enthralling discussions on humanity. It may get to a point of extreme cynicism, what with the revelation that the purpose of our lives is basically to procreate and successfully nurture the next generation to carry forth our genetic material, that notions of “true love” and monogamy have evolved only because human babies require enormous parental investment and resources from both parents for several years to be able to mature and survive. No wonder why even religion presses us towards the noble cause of raising our young. But, there are exceptions in our species - those who have gone beyond nature’s instincts to redefine altruism and morality. And it’s in our limited scope to aspire to fight against our instincts and rise above the rest.